Luxury villa with private garden and swimming pool just 15 min walking from the center of town Hvar on island Hvar. Villa Cvita is located in the peaceful western part of Hvar town, 50 metres from the sea and small, pebble beaches. A pleasant 15-minute walk along the shore will bring you to Hvar town centre. 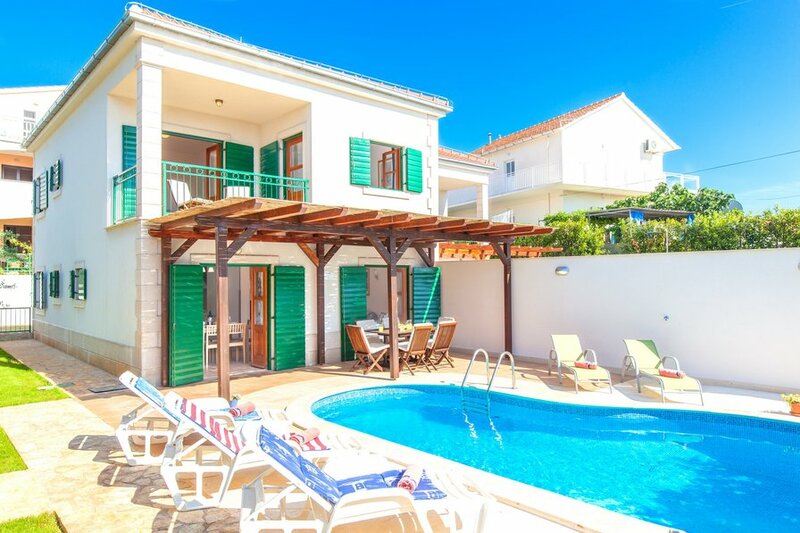 This Hvar vacation villas has been fitted out with the most attractive, modern furniture. Villa Cvita consists of a kitchen/dining area/sitting room, four double rooms (2 double-bedded rooms, 2 twin-bedded rooms), three bathrooms and a terrace. Villa Cvita has two floors and can accommodate up to 8 people. It is ideal for family holidays or groups of friends. On the ground floor there is a large, open plan kitchen/dining area/ sitting room, with French windows opening onto the covered part of a private garden with garden furniture, which leads to the private outdoor pool. To make your stay in Villa Cvita as pleasant as possible, the villa has been equipped with air-conditioning, satellite TV, hi-fi, a direct telephone line and Internet connection. To protect your peace and privacy, Villa Cvita is only available as a complete unit, with garden and pool. Note: Tourist tax is not included in price. Needs to be paid upon arrival. Please take into the consideration that there is a deposit policy in case of damage during your stay in the villa. On your arrival after check in you will have to fill Credit card authorization form for the sum of 500 EUR. If everything is ok, and no damage hasn’t been done the preauthorization will be cancelled itself.